The Apperta Foundation is a clinician-led, not-for-profit company. Supported by NHS England, NHS Digital and others, we promote open systems and standards for digital health and social care. We show how the delivery of health and social care can be transformed when data, information and knowledge in IT systems is open, shareable and computable. Bill is the current chair of the Apperta Board of Directors. As well as being a consultant ophthalmic surgeon, Bill has also served as CCIO and medical director of Moorfields Eye Hospital. He is a knowledgeable and passionate advocate for digital technology and the benefits of open source and open standards within health and care. Phil has been a GP Partner for over twenty years, and a Chief Clinical Information Officer for five of those. As a member of the Royal College of GPs Health Informatics Group, he has a long-standing interest in the uses of information and technology to integrate and transform patient care. A practising Consultant Psychiatrist for over twenty years, the UK's most widely read Health IT columnist, and now both Director of Connected Health Cities and Chair of the national CCIO Network, Joe has acted as Caldicott Guardian, Clinical Safety Officer, an NHS Trust Medical Director and National Clinical Lead for IT. This formidable experience in the health sector has given him a deep understanding of how technology can bring improvements to both clinicians and patients. Peter is passionate about making improvements for patients and clinicians through better use of IT, he is the NHS Digital nominated Director on the Apperta Board to provide national strategic insight. Formerly a Consultant in Emergency Medicine and CCIO at Leeds Teaching Hospitals, Tony has a wealth of experience in both medicine and IT. With a masters degree in IT management in addition to his years of experience as a clinician, Tony has understanding and insight into healthcare IT that few can match. Tony is also director of the Ripple Foundation and a member of the OpenEHR foundation. We provide governance, support and funding to a range of programmes, all of which contribute to our mission to transform health and social care through open systems, standards and data. Some, like Code4Health, are a way of working collaboratively to generate innovation, others, like CKM are tools to help generate new data models, others again are specific pieces of software. All are linked by their fundamental commitment to the power of open digital platforms. 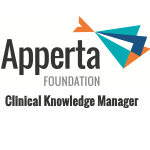 The Apperta Clinical Knowledge Manager (CKM) is a free to use international, online clinical knowledge resource. It is a repository for clinical models, developed by Code4Health Communities and other projects that provides users with the tools to develop, share, review and govern clinical models. The Apperta Foundation regularly provide training in open clinical modelling and the tools needed to develop, review and govern clinical models. 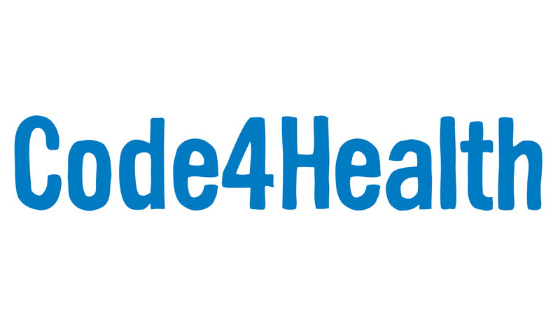 Details of any future training events can be found at the Code4Health Events page. Code4Health™ is a social movement aiming to educate and inform all participants in the health and care community about the possibilities digital technologies open up in health and care and equip them with the tools, knowledge and skills to work together to develop and implement high quality open digital solutions. Templates are used to create definitions of content such as a particular document or message, required for specific use cases, such as specific screen forms, message types or reports. 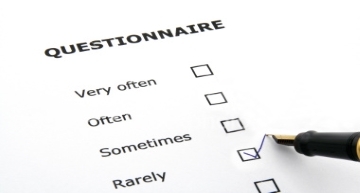 Typical examples include 'acute care discharge summary', 'GP referral' and radiology report'. A list of the openEHR templates curated by the Clinical Content subcommittee can be found below. 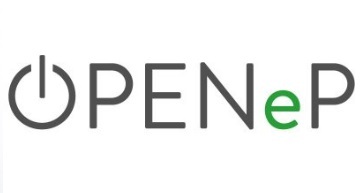 OpenEyes™ is an Electronic Medical Record (EMR) application for ophthalmology, which enables clinicians to access information they need about their patient in one place. Support and implementation services are available via g-cloud from our Apperta Partner AB EHR. Overall governance for the Apperta Foundation is provided by our Board of Directors; we also have sub-committees who govern the development of particular services or products. As with our board, each sub-committee is clinically led to ensure work is always for the greatest benefit to patients and professionals. Launched in February 2019, the IXN for the NHS subcommittee has been established to allow Industry, Academia and clinicians to work hand in hand to advance the UK's healthcare technologies with Interoperability, Efficiency and Innovation through open source. 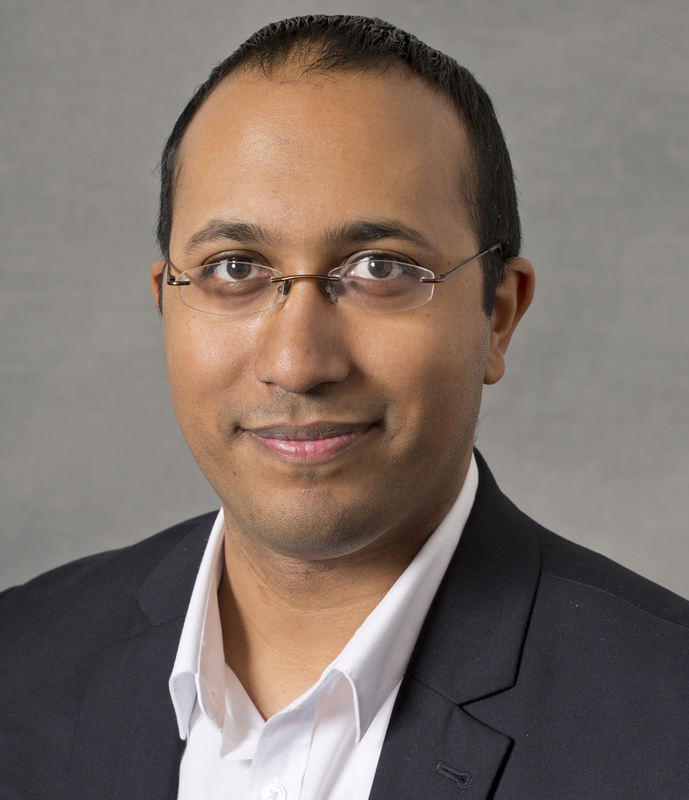 The Chair of the IXN for the NHS sub-committee is Dean Mohamedally, a Principal Teaching Fellow at the Department of Computer Science at University College. Dean pioneered the concept of the industry exchange network in the Department of Computer Science at University College London where it has been in operation of over seven years. The Subcommittee will work to promote open systems and standards across the NHS. They will support the aim to make the data, information and knowledge within IT systems open, shareable and computable. This will facilitate the creation of innovative digital services to transform the delivery of health and social care. The PROMs subcommittee guides the development of solutions for Patient Reported Outcome Measures bringing a new level of usability and functionality for clinicians, patients and informaticians using digital tools. The sub-committee Chair is Professor Mike Reed, a Consultant trauma and orthopaedic surgeon at Northumbria Healthcare Foundation Trust. He specialises in trauma, and hip and knee arthritis including revision joint replacements and has been a consultant with the trust since 2003. The Subcommittee includes representatives from England, Scotland, Ireland, Northern Ireland and Wales. The primary purpose of the Subcommittee is to drive and influence the development and quality improvement of open and shared clinical content for eHealth projects via a collaborative community, and to encourage and facilitate its use in real e-health implementations. The Subcommittee will work to promote open systems and standards for digital health and social care. They will support the aim to make the data, information and knowledge within IT systems open, shareable and computable. 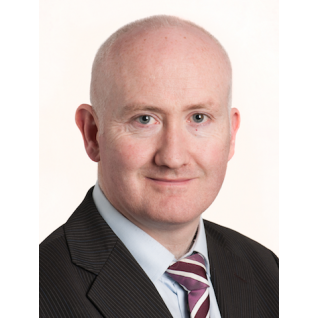 The Subcommittee is chaired by Shane McKee, a Consultant in Genetic Medicine at Belfast City Hospital an is also Chief Clinical Information Officer for Belfast Health & Social Care Trust. He is currently involved in the development of technology-enabled change in the Trust, and the wider regional EHR work, known as the Encompass Project. The open-eObs sub-committee contributes clinical leadership and development oversight to open-eObs. 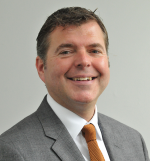 The sub-committee chair is Adrian Burke, consultant psychiatrist and CCIO at Cheshire and Wirral Partnership NHS Foundation Trust (CWP), a mental health and community service provider. Adrian sits on the Royal College of Psychiatrists' Informatics Committee and is a member of the Digital Health CCIO network. He is interested in how evidence based practice informs the development of apps that are fast, error-free and effective in supporting practitioners and patients. 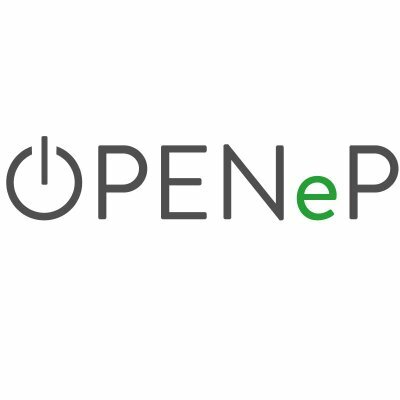 The Open EPMA subcommittee guides the development of OPENeP, bringing a new level of usability and functionality for both ePrescribing and medicines administration and provides the foundation for a new generation of digital tools to support medicines management. The sub-committee Chair is Duncan Cripps. 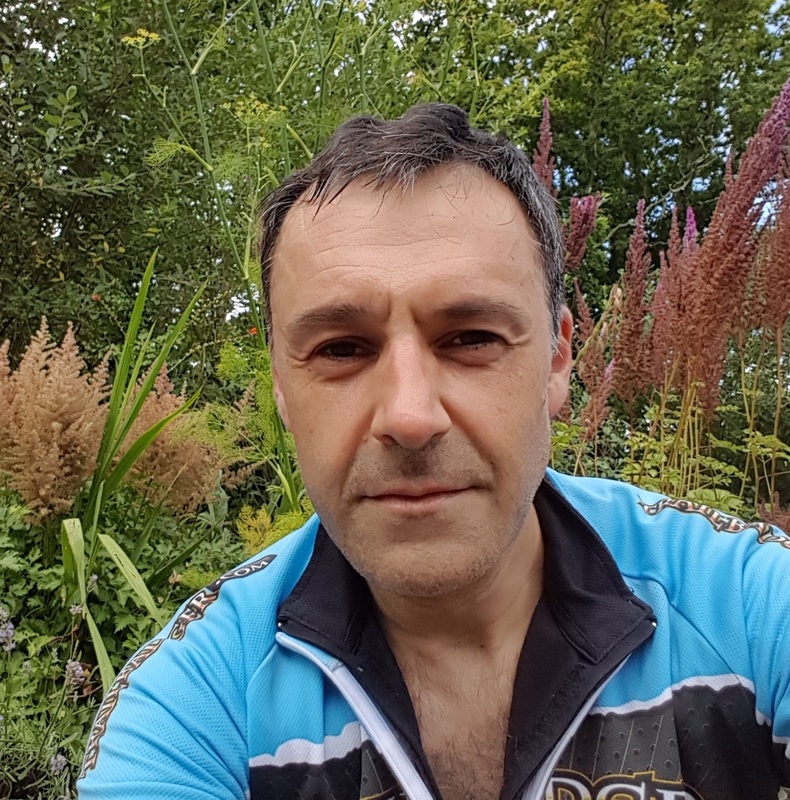 A clinical pharmacist with 26 years NHS experience, Duncan is currently the Lead Pharmacist for Electronic Prescribing at University Hospitals Plymouth NHS Trust and Clinical Academic Lead for Pharmacology & Therapeutics at Peninsula Medical School, University of Plymouth. He is keen to maximise the benefits of an open standards approach to support the safe and effective use of medicines across the health community. The Physical and Mental Health subcommittee guides the development of solutions for to assist patient to manage their physical health to support their mental health. The solutions aim to assist the patient and clinician to discuss openly how a patient can manager their own physical health with some support using digital siolutions. 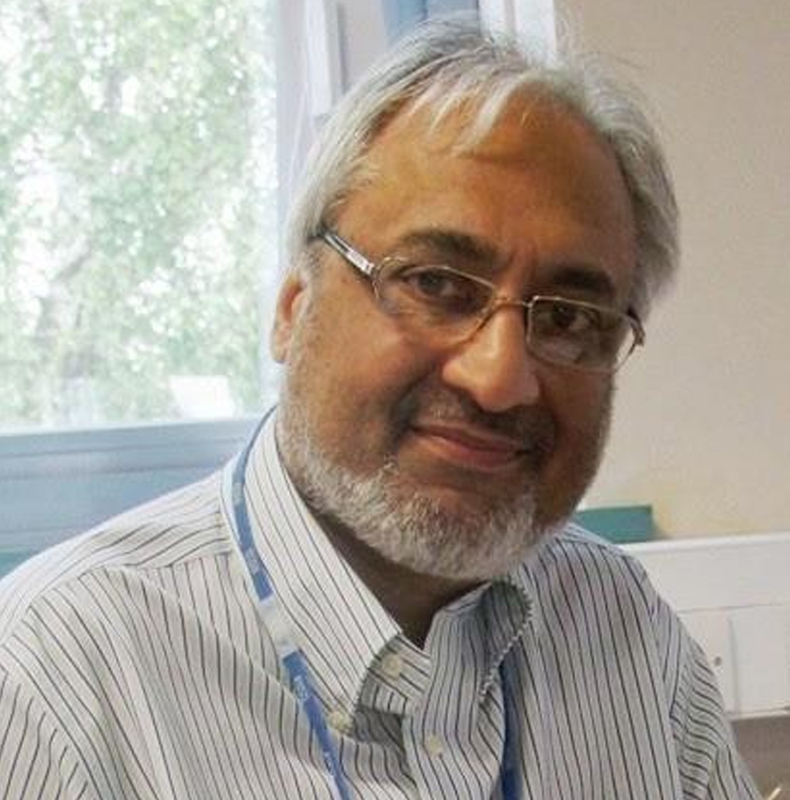 The sub-committee Chair Dr J S Bamrah, MBE, FRCPsych Consultant Psychiatrist; Honorary Reader, University of Manchester; Council Member BMA; National Chairman, BAPIO. We want to begin articulating our view of the world in a set of documents that stimulate productive debate and generate useable ideas. They will appear here as they are released. The document outlines a radically new approach to electronic health records. It proposes a personal health record, co-produced by the patient and those providing care to them, that guarantees the rights and enforces the responsibilities of all parties. It provides a medico-legally robust record that can be relied upon as an authoritative record and represents the first step away from organisation-centric records to a patient-centric record. This approach creates an open ecosystem in which the patient chooses where they store their record and who has access to it. It guarantees record portability and allows multiple parties to provide a CoPHR and applications that can access it. It is based on open standards and open platform principles, such that there is no vendor or data lock-in. 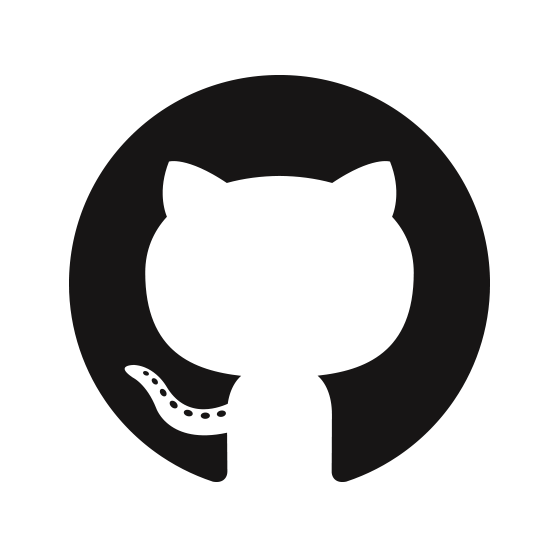 The latest published product code is available free and open source via our code repositories. Apperta Partners are available on Digital Marketplace and SBS frameworks to configure, support and implement these solutions for you. 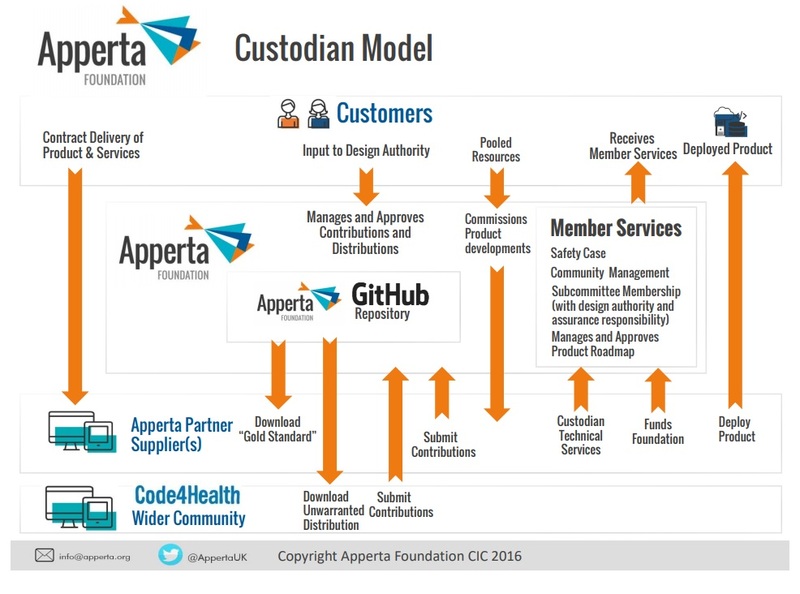 You can read more about our custodianship model and how it works here. There has been growing global interest in the concept of an Open Digital Platform for health and care based on open standards. 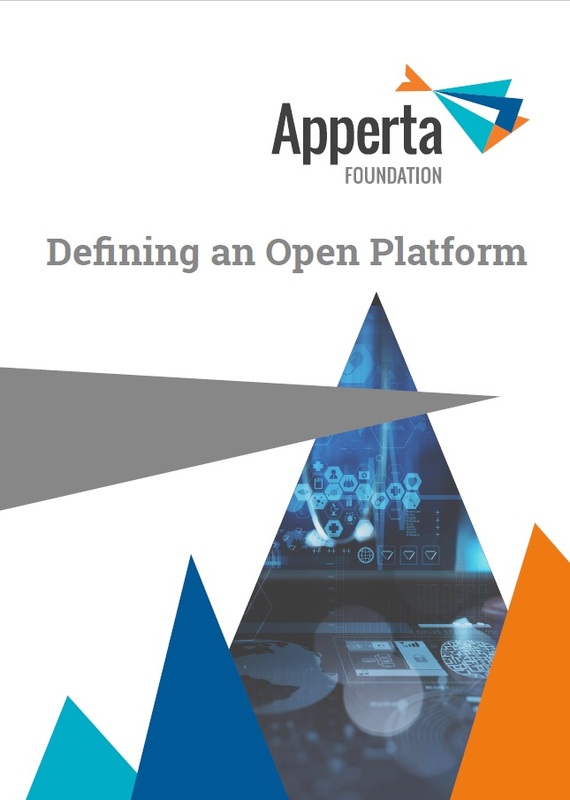 In October 2017, we published “Defining an Open Platform” to make the case for open platforms and lay out a blueprint for an open platform architecture at a level of detail that would allow any willing party to build a first generation implementation of an open platform that would be interoperable with any other. Our proposal is based on HL7 FHIR, SNOMED-CT, IHE-XDS and openEHR and draws on pioneering work globally and in the UK that have proven how these standards can be used to build an open platform. Since publication we have seen increasing interest in open platform approaches with open platform technology being implemented by a number of NHS Trusts, Genomics England and The City of Leeds for its PHR.